In this tutorial, I will show you how to easily turn your WordPress blog from the default NoFollow to a DoFollow blog without the need of a plugin. Why not turn your blog into a DoFollow blog and get more visitors, more traffic and eventualy more recognition in the Online community. Probably you already have seen some blogs displaying the DoFollow image and you wonder how it is done and what it really means. Read my next tutorial for a closer look at DoFollow versus NoFollow. What are NoFollow and DoFollow? DoFollow is a term that does not really exist. It is a slang term given to Websites that are not using nofollow. nofollow is a value that can be assigned to the rel attribute of the HTML anchor tag to instruct some search engines not to pass on any influence to an outbound link. The nofollow value was intended to stop comment spam in blogs. Commenting is recognized as a good way to get one way backlinks. But it has been abused and thus the creation of the nofollow value back in 2005. You might already know that NoFollow blogs do not carry any PR value to other Websites through commenting. If your blog is DoFollow then comments made by your users get Link juice, meaning that your blog passes on the PR value to the commenter. Should You Set Comment Links To DoFollow? One way to encourage your readers to comment on your blog is by making your blog DoFollow. If your blog is new and you are trying to increase traffic then you need to turn your blog to a DoFollow blog. When people comment on your content they are adding value to your content. Some consider DoFollow as bribing visitors for comments, while others consider it as rewarding visitors that leave a comment. I tend to agree with the latter, but whatever your opinion is, DoFollow encourages interaction with your readers. One negative side though is that it increases comment moderation duties and an increase of spam comments. Yes, there are several plugins that turn your blog to a DoFollow blog. But I encourage you to read my previous article about unnecessarily adding plugins to your theme. Also, you really don´t need a plugin for such a simple task. How does NoFollow and DoFollow Look Like? The only way to know whether a link has been set to NoFollow is to look at the source code of the page. There are several ways to do that depending on the browser you use. To look at the source code, select “source” from your browser´s menu or you could right click on the page to view the source from the context menu. Also, Mozilla Firefox browser has add-ons that highlights a nofollow link on the page without actually looking at the source code. The code is added to your theme´s functions.php file. The core WordPress code is not modified in any way. The code is split into 2 independent sections (Section1 and Section2). You have the choice to choose either one or both. The code is tested to work with the latest version of WordPress. However it also works with earlier versions. To change your Comment links from NoFollow To DoFollow, Open the functions.php file located in your theme´s folder, and add (copy and paste) the following code. 1. Section1 of the above code changes the author´s link in the Comment section to a dofollow instead of the WordPress default of nofollow. 2. Section2 of the above code changes all links in the Comment text to a dofollow instead of the default WordPress of nofollow. 3. You have the choice to apply either Section1 of the code or Section2 or Both. For this Blog, I applied both Sections. The image below shows what does the above code affect in the Comments section of your WordPress blog. In the above code, if you leave any white space or a newline between lines 4 and 5, you will get the following error: Warning: Cannot modify header information - headers already sent by … , in your login screen and after you login to your WordPress dashboard. What is your opinion about NoFollow or DoFollow? Does link juice mean anything to you? How easy did you find this tutorial to implement? If you have something to say, please share your opinion in the DoFollow Comment section and get your reward. Your opinion matters, unless it is a Spam. By the way, this blog is now a DoFollow blog. I would like to ask, in changing the blog became dofolow wouldn’t be easier using plugin …? This does not work with my theme. When I tried to add it to my functions.php, it returned a 500 error. Thanks for the code. I am a little hesitant about inserting code (I am not a programmer and don’t want to mess anything up), but I’ll give it a shot. I have been looking all over for do follow blogs and it seems like they are no where. I didn’t even realize that no follow was the default setting on wordpress. This is a really interesting article. Was looking for it. Was not very sure whether to make comments dofollow or nofollow. This helped me take the right decision. I feel yes, newbies can put dofollow to the comments and later switch to nofollow if required. 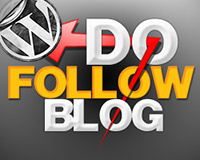 Yah this is the way to change no follow wordpress blog into dofollow blogs.do follow blogs will help increase comments and traffic on your blog. Thanks for the clarification. I’ve employed the code on my site. Based on past experience, I just won’t advertise the fact. I agree that the most important links to “follow” are the commenter’s URL and their last post if the blog is using “CommentLuv” which provides the option to follow that link. So, there is less pressing need to “follow” the links in the text area. Just curious. 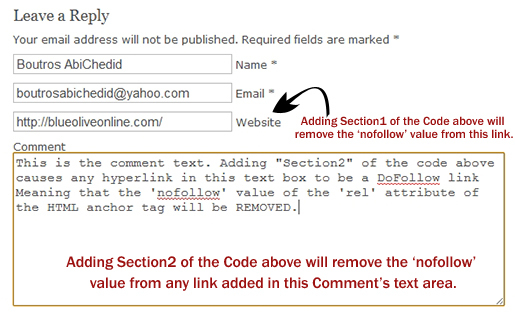 You said in your article, that for this blog, you applied both sections of the code, so links placed within the comment form text area should NOT be “nofollow.” However, your links within the comment form text box on your replies to comments ARE “nofollow.” Is that because you changed your mind on the value of eliminating “nofollow on comment form text box links, or is it that the code is not working as designed? That’s right John. I reinstated the ‘nofollow’ to links in the comment’s section (textarea). The code works absolutely fine. I just removed the code for that specific purpose. 58 queries in 1.496 seconds.